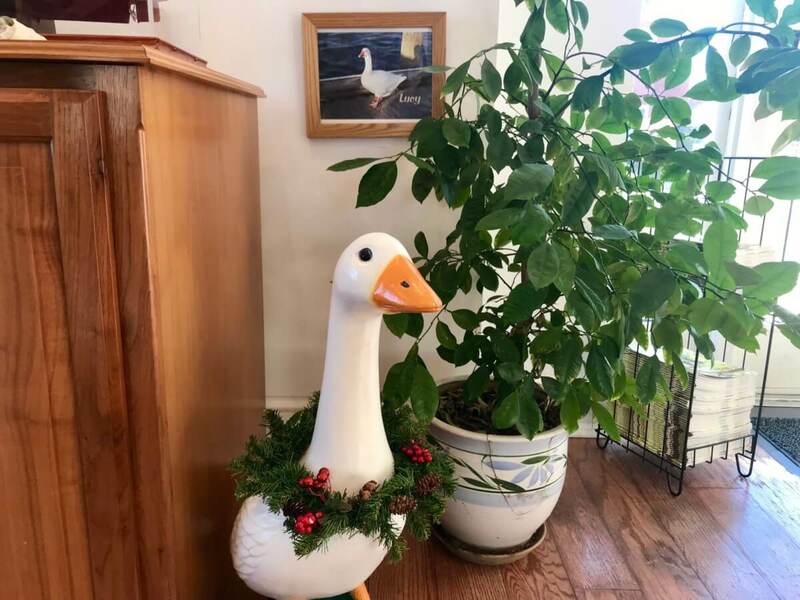 Lucy, the late Chestertown goose that presided over the Chester River for 15 years, was truly beloved by all. She’s commemorated with a bronze statue on the Boardwalk, and a smaller sculpture in the town’s Visitor Center, which is where we met her. The town is Hallmark movie-esque. As my fiance put it, if there were 100 clones of my mother Sheila (who loves Christmas Hallmark movies) running around in the world, they would all choose to live and form an idyllic society in Chestertown. This one’s an actual fact: In Maryland, Chestertown is second only to Annapolis in its number of eighteenth-century homes, which line the streets and waterfront and contribute to its picturesque setting. If I’d had more than a few hours to spend in the three-plus centuries old town (which overflows with Colonial history and which George Washington visited at least eight times, as told by the sign above), the bullet points would likely be innumerable. 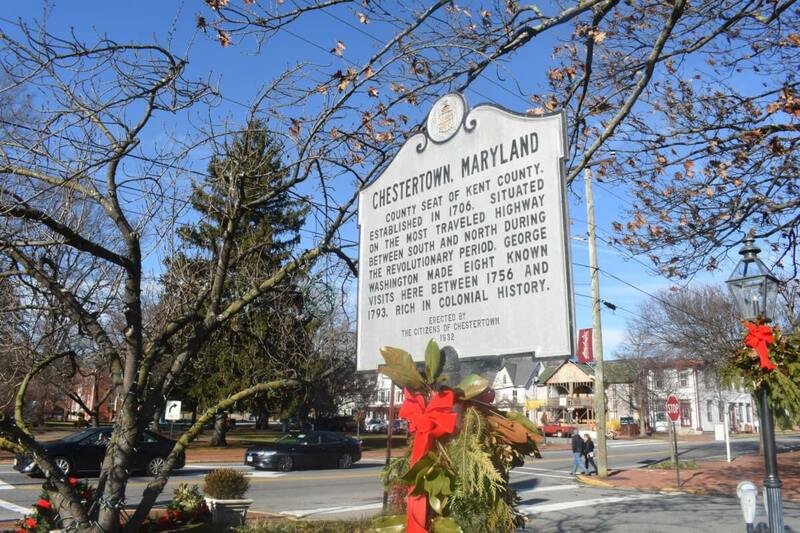 Chestertown is a quaint Maryland town on the western side of the Eastern Shore. The seat of Kent County, it’s about 45 minutes from Smyrna, DE, an hour-and-a-half from the southern Pennsylvania border, and an hour or so from Annapolis, which is where my fiance B.L. and I were traveling from. Christmas came, and the Friday after, we made the hour-long venture to the small Kent County town with cameras in hand and absolutely no idea what to expect, at least on my part. The drive there was one that I’ve come to know well after a few years of commuting to and from the Eastern Shore: After the Bay Bridge, you’re in for miles upon miles of rolling pastures, which are beautiful if you’re paying attention and not operating on auto-pilot (which I admittedly sometimes am, but not today). This was my first time taking 301 toward Wilmington rather than 50 toward Ocean City, but there weren’t any major differences in landscape: There are abandoned farmhouses between the family ranchers, most of those with holiday lawn ornaments still in the yard and pretty wreaths still on the doors. Turkey vultures pick apart the carcasses of deer on the side of the road, which you’re no longer so saddened and disgusted by after seeing so many of them all winter long. 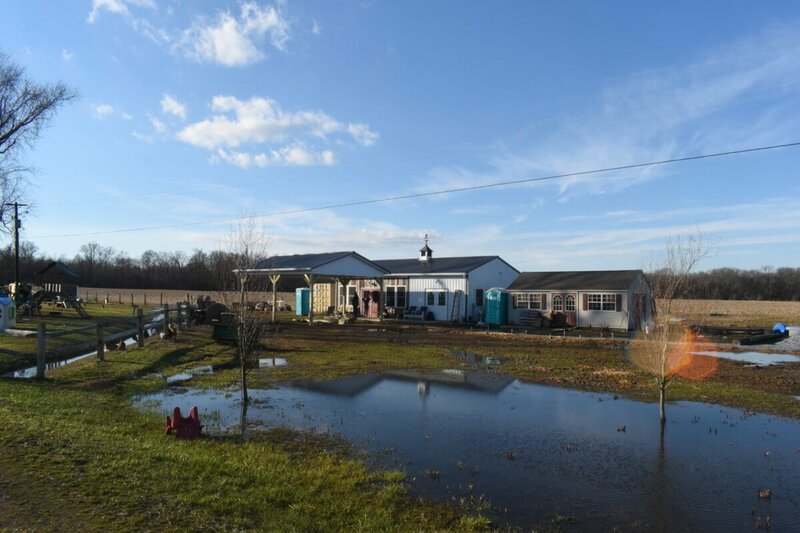 And if it’s been raining for any length of time, which it had for the past few days, front yards have grown shallow ponds of murky water, and some of them seep into the streets. Not bad enough for hydroplaning this time, though — thankfully. We passed the historic Church Hill Theatre on our way, and I thought we’d arrived. Not yet. 10 minutes, a number of closed-down pizzerias, and finally the bridge over the Chester River later, and we did arrive. Our first stop was in the Visitor Center, which we hadn’t exactly planned, but it was right on the way into town. Good idea, Chestertown. We collected about 12 brochures and maps which I think are still on the floor of the CRV, most of them still unread (sorry, Chestertown and trees, but I can never resist a good brochure), but the best part of the Visitor Center aside from its library of Maryland maps and travel pamphlets was the Goose statue. I learned that it was of Lucy the Goose, a now-deceased town mascot of sorts. Yes, I thought. I love random and beloved town mascots. We left the Visitor Center and found a parking spot on the street by the Fountain Park. 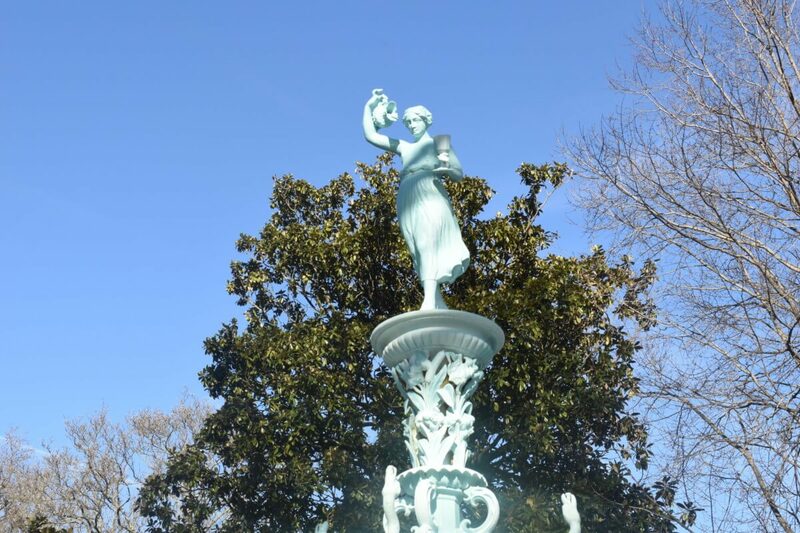 The fountain of Fountain Park featured Hebe, the Goddess of Youth, and the faces of lions with long, pink tongues. The walk around town was beautiful, from High Street to offshoot side streets with quaint boutiques, galleries, and coffee shops. 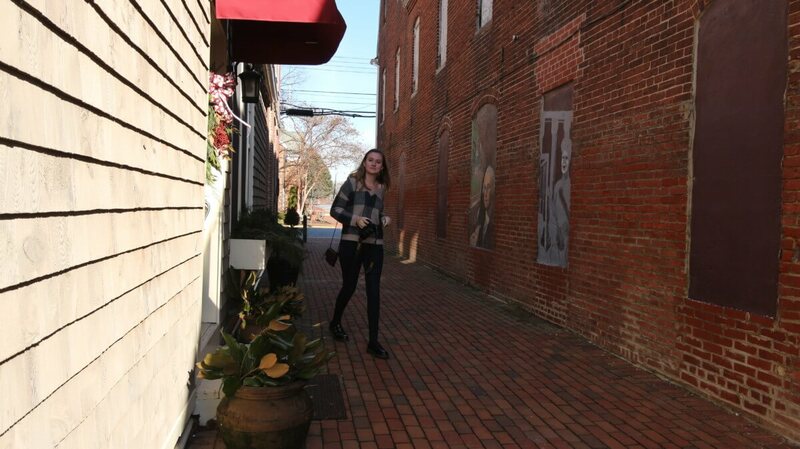 Walking down an alley, looking for street art. “This is like Annapolis, if you picked it up and dropped it in the middle of nowhere,” BL said. 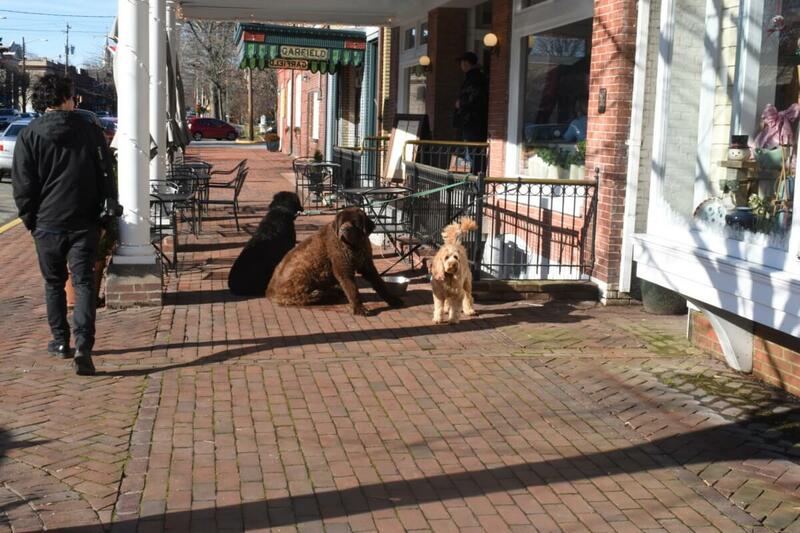 Chestertown residents, please don’t be angry over that comment — the ‘middle of nowhere’ part is relative and your charming eighteenth century-village of a town obviously isn’t Annapolis — but there are similarities in the towns’ architecture, and the restoration of centuries-old buildings now home to independent businesses and very happily not abandoned. We visited Bozeman, MT last summer, and many of their city’s downtown buildings were crumbling, abandoned, and often oddly guarded by stray dogs. This is rarely ever the case in Maryland’s downtown communities. Annapolis or Chestertown, I’m always glad to see the preservation of beautiful, historic gems. No strays here, only pets tied to posts while their owners brunch. Monument Park meanwhile, across the street from Fountain Park, serves as a memorial to those who have served, particularly in the Civil War, where brothers in town were often seen fighting for opposite sides — Chestertown had its share of Union and Confederate soldiers alike. One large stone monument, erected in 1917 by James A. Pearce, is inscribed with the names of all the county’s white soldiers who fought in the war. 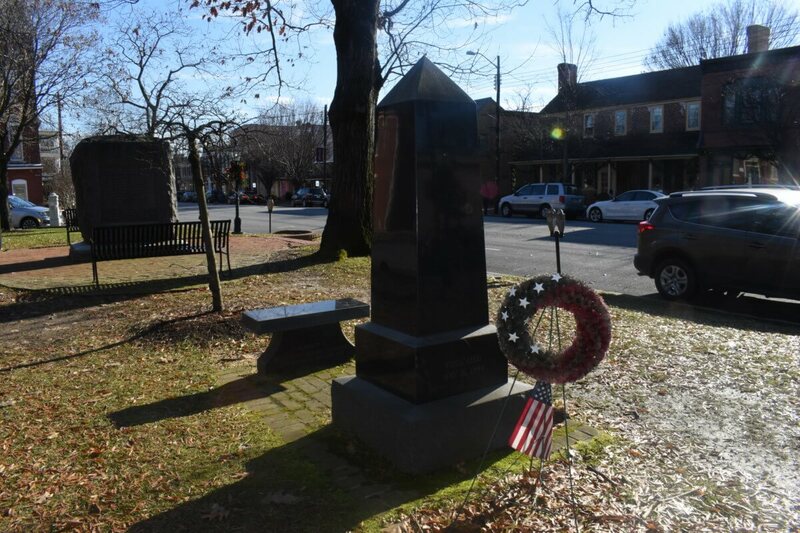 A smaller monument memorializes the more than 400 black soldiers of Kent County who fought for the Union. 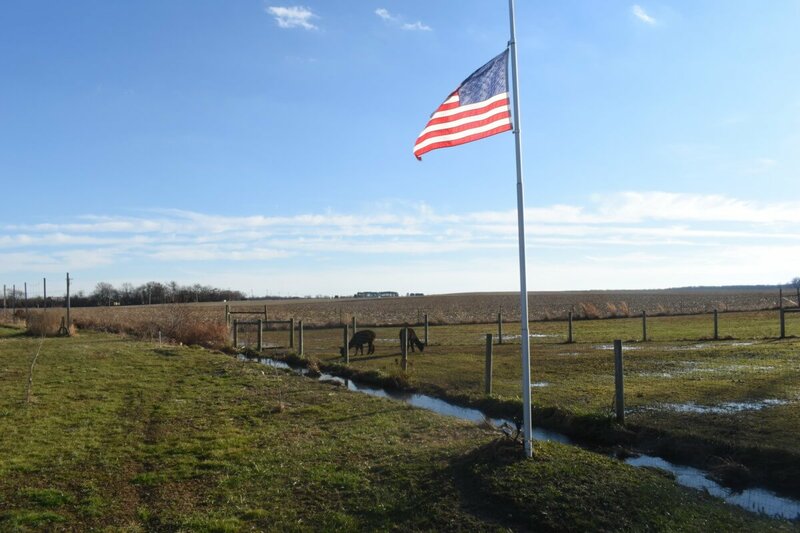 That monument was erected by the Parker White Post of the American Legion in 1999. Monument to Colored Troops of Kent County in the Civil War. 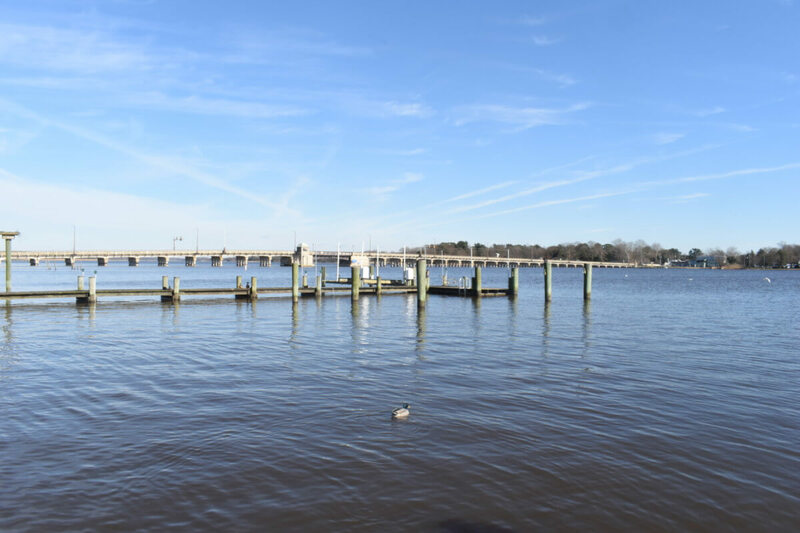 After watching the ducks and geese down on the river but before leaving Chestertown for good, we dropped by the Fish Whistle, a beer-and-seafood type of joint that sits right on the water. 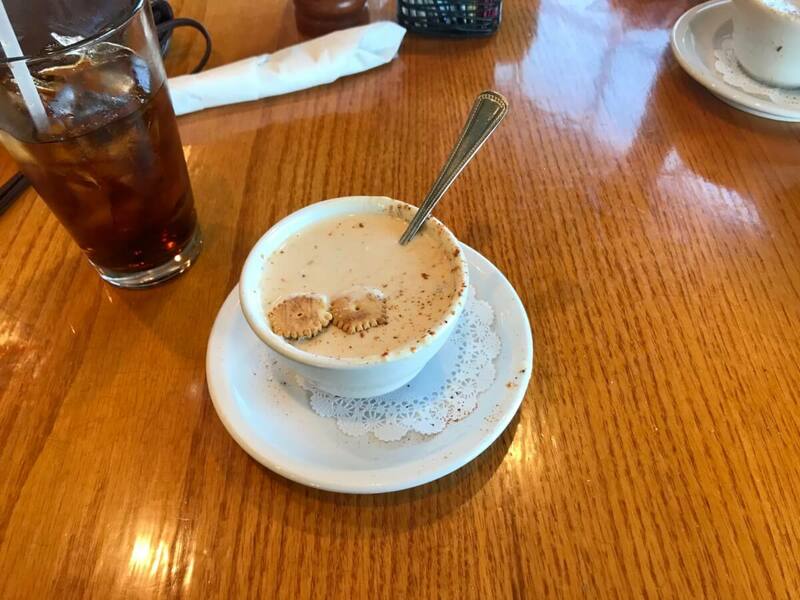 We sat by the window and enjoyed some of the best cream of crab soup on the Western Shore (I’m guessing). Crab soup and a Coke, 10/10. We almost went straight home after that, deciding that nothing could top the Fish Whistle’s cream of crab and that we might as well call it a day. 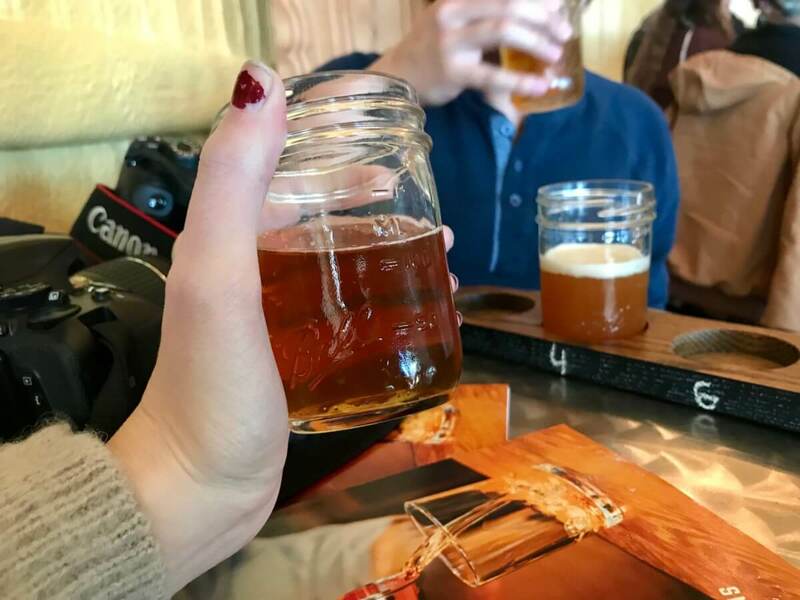 But, realizing that we were right next to Queen Anne’s County and that Sudlersville couldn’t be more than 20 minutes away, I decided to take a detour on the way home and stop for a beer at Patriot Acres Farm Brewery. I’d learned of the new brewery through my work for Shore Craft Beer, and hadn’t stopped thinking of it since. Namely because the brewery sits on a working alpaca farm. So we did stop at Patriot Acres and it did only take about 15 minutes to get there. I was only slightly disappointed that the ground was soggy after a few days of rain, impeding my trek to the alpaca enclosure, and that a yellow lab named Leo barked at me when I tried to sidestep the puddles and get close. The alpacas — so close, yet so far away. The beer is the main attraction, anyway. Try the Alpaca Pale Ale. Patriot Acres was unlike any microbrewery I’d been to before. The interior was like a cool, cozy farmhouse shed, and it was absolutely packed with families inside. Kids played games, moms and dads sat at the bar, a woman was casually walking around with a chicken sitting on her shoulders. BL and I found a table for two and shared a flight while gawking at this chicken lady and reminiscing on the day of adventure that was now almost behind us. The day was a good one. In Chestertown, I recommend Monument Park and the Fish Whistle’s cream of crab soup. And at Patriot Acres Farm Brewery, I recommend the Alpaca Pale Ale and the little black chicken we saw with a tuft of white hair that looks like a tiny chicken wig. And the chicken lady, wherever she is now. Kristin is a writer and photographer based in Annapolis, Maryland, though she also spends ample time on the Eastern Shore with her dog and fiance by her side. She's the content manager for Maryland.com and other State Ventures, LLC sites. She loves getting reader-submitted stories and photos, so send her an email anytime at kristin@oceancity.com. Her photos can be found on Instagram @adventuresinmaryland.